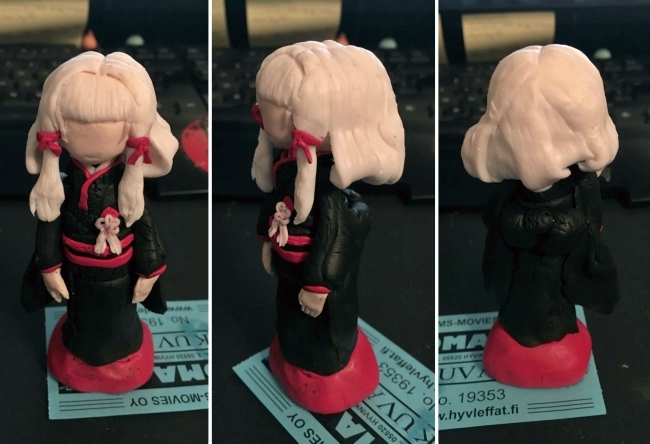 I've always wanted to have a proper Fatal Frame figures, but there isn't one I decided to make some myself! I use Fimo Polymer Clay, when these are ready I'll bake them in oven and paint all the details. I started making Mio first, but she ended up being too small for proper details. Also sorry for the low quality, when she's ready I'll take pictures of her in natural light. I'll post more when I have motivation to finish her (and maybe show some other progress pictures from other characters). Ahh, she's so cute! I totally want one. I love the detail on the little knotted ribbon thing at her belt. Please do post again when she's finished, I'd love to see! it's really good and really cute I can't wait to see the results!!! wouldn't it be hard to make a figure with legs like this?